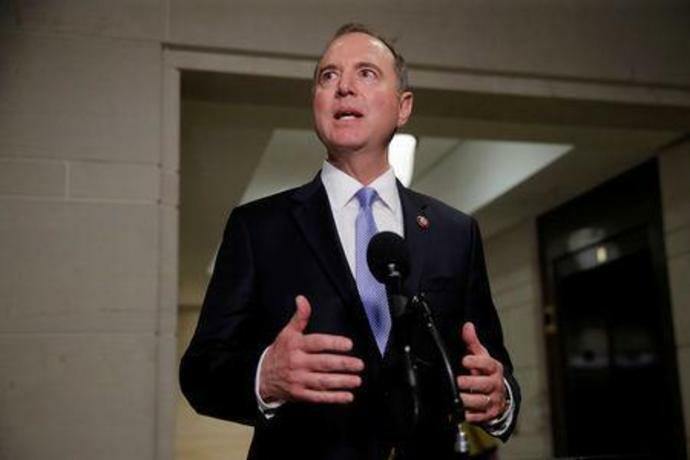 WASHINGTON (Reuters) - U.S. President Donald Trump and fellow Republicans in Congress urged House intelligence committee chairman Adam Schiff to resign on Thursday, drawing an unequivocal rejection from their Democratic target. "Congressman Adam Schiff, who spent two years knowingly and unlawfully lying and leaking, should be forced to resign from Congress!" Trump wrote in an early morning Twitter post. Republicans on Thursday intensified the counter-attack they launched when Attorney General William Barr issued a summary on Sunday of Special Counsel Robert Mueller's 22-month investigation into whether Trump's campaign worked with Russia to sway the 2016 presidential election. Barr said Mueller had been unable to find that the Trump campaign conspired with Moscow to influence the election. The special counsel left unresolved questions about whether the president obstructed justice. Within hours of Trump's tweet on Thursday, Republicans on the House committee used the start of a hearing on Russia and efforts to influence U.S. elections to attack Schiff. They said all nine Republican panel members had signed a letter asking him to quit. Schiff, who has not been accused by authorities of leaking classified information, responded strongly as the hearing erupted into acrimony. He delivered a laundry list of the Trump campaign's contacts with Russians, from Donald Trump Jr. welcoming a Russian offer of dirt on Democratic rival Hillary Clinton, to short-lived national security adviser Michael Flynn secretly discussing U.S. sanctions on Russia with Moscow's ambassador. "You might say that's all OK. You might say that's just what you need to do to win. But I don't think it's OK. I think it's immoral. I think it's unethical. I think it's unpatriotic and, yes, I think it's corrupt - and evidence of collusion," Schiff said. House Speaker Nancy Pelosi strongly defended Schiff, calling the actions of Trump and committee Republicans "shameful" and "irresponsible." "They're afraid of the truth. They're afraid of competence," Pelosi, a Democrat, told her weekly news conference on Thursday, adding, "I'm so proud of the work of Chairman Adam Schiff." At Thursday's hearing, the committee's top Republican, Devin Nunes, yielded time during his opening statement to fellow Republican Representative Mike Conaway who read the call for Schiff's resignation. "We have no faith in your ability to discharge your duties in a manner consistent with your constitutional responsibility and urge your immediate resignation as chairman," Conaway read, accusing Schiff of having knowingly spread "false information." The House intelligence committee has been bitterly split along party lines for years over the Russia probe, which was taken over by Mueller in May 2017 after Trump fired FBI Director James Comey. The U.S. intelligence community has concluded that Russia sought to influence the 2016 presidential election to boost Trump's chances of winning the White House, and continues to attempt to interfere in U.S. and other countries' elections. Senate Homeland Security Chairman Ron Johnson told Reuters on Thursday he planned to join Senate Judiciary Chairman Lindsey Graham, a fellow Republican, in a review of what motivated an investigation that led to Mueller's probe.